2.) Set a name for your slider. 3.) Choose to either give your slider a set height and width, or choose to show your slider as full height and/or width. 4.) If choosing to show your slider as full-height, you can set a Full Height Offset. This is done by adding the the id of the div that you would like to offset. For example, #kad-banner. 5.) Choose to have the Respect Image Aspect Ratio on or off. This will ignore the full-height and display the images based on the uploaded ratio once they fall below the max height. Please not that when this is on you cannot use with full-height or parallax. 6.) Choose whether or not to auto play your slider. 7.) Set the time in milliseconds that your slider stays on a slide. 8.) Choose whether or not the enable the parallax feature. If choosing to do so, ensure your images are at least 1800px by 1200px. 9.) Choose whether or not to have navigation on your slider. If you are creating a single slide slider then more than likely you will want this off. 2.) Upload an image or set a color for the background of your slide. 3.) Set your background position and size. See here to learn about background image sizing. 4.) Choose whether or not to add layers (text, buttons, images) to your slide. 6. ) Click Add Slide repeat above steps as necessary. 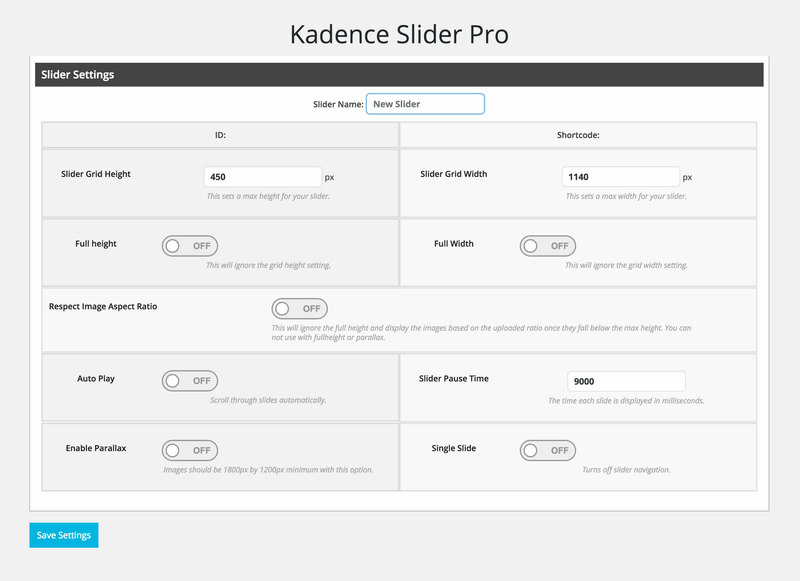 To display a Kadence Slider pro on your homepage start by going into Theme Options > Home Slider. 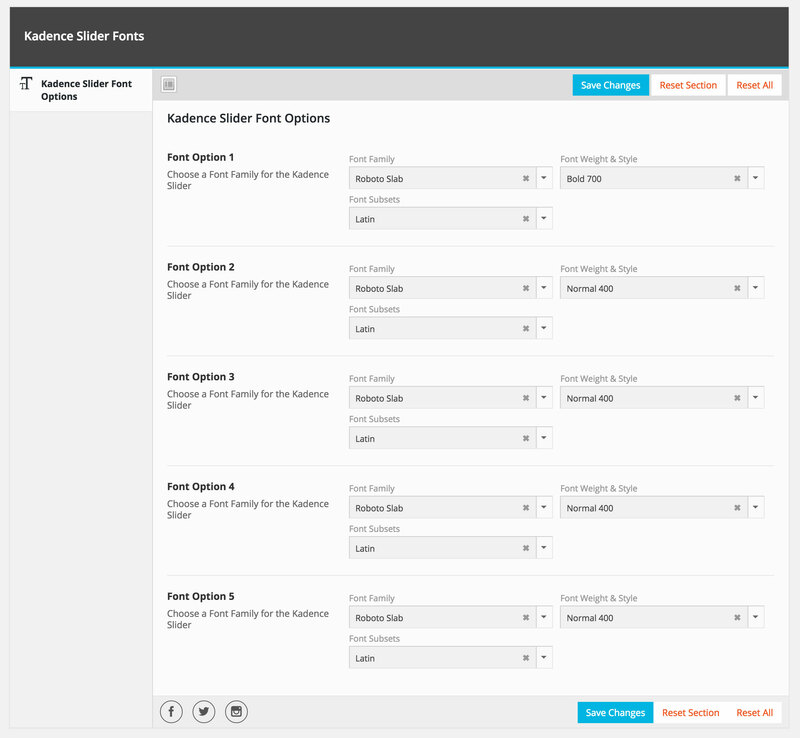 From there choose a home image slider and select Kadence Slider Pro. 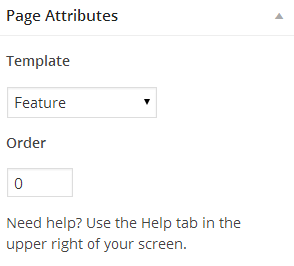 Then select the slider you want shown on your homepage. 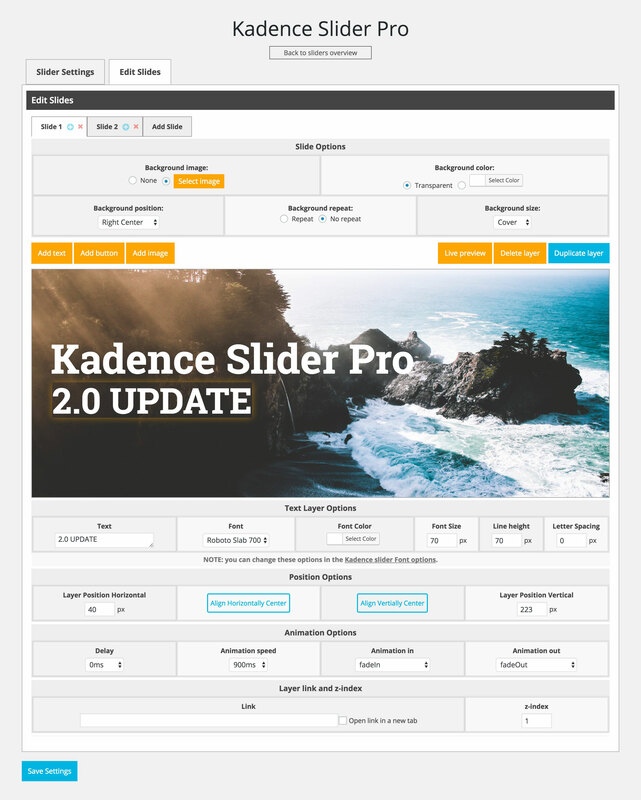 The Kadence slider pro shortcode makes it possible to display your slider almost anywhere. You can paste it into your sidebar, footer, post page, etc. We’ve included several examples below. A slider can be displayed as a widget by pasting the shortcode into the Text widget. This will open up meta boxes under Feature Page Options. From there, select Kadence Slider Pro and paste the shortcode in the Cyclone or Kadence Slider box.